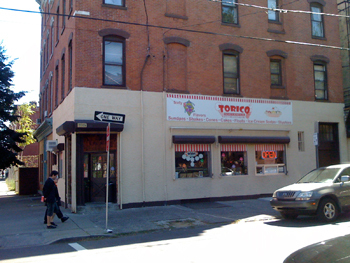 We’d all but given up on Torico Ice Cream ever returning to the corner space on Erie and 1st Street. 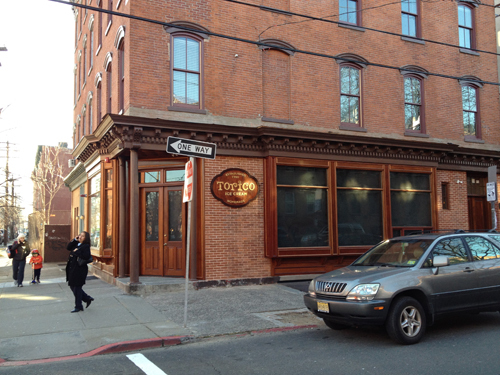 The renovation project of the beloved ice cream parlor began in October of 2010. 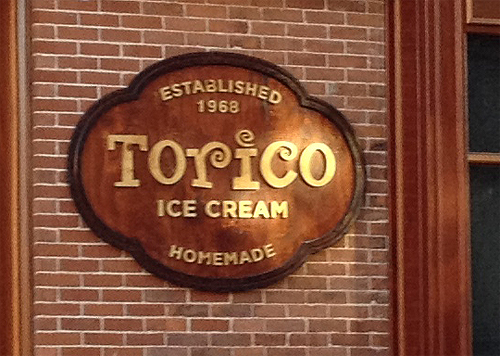 Many hoped to see Torico reopen by the summer of 2011 and indeed handwritten signs promised just that begin in May. Updated signs in July promised an opening in August, and then another in September. When the first year anniversary of the renovation project passed, we had all but given up hope. Furniture inside the ice cream shop has been in place on and off since the late summer and exterior work on the building had wrapped up then as well. Sidewalk cuts indicating access to some sort of utility had been ongoing into the autumn, but even that wrapped up in 2011. And then a few weeks ago, the sign appeared on the exterior of the building once more promising the creamy goodness of homemade ice cream. The renovation of the building included removing the plaster facade along the street level, restoring the brick and replacing the door and window frames. Historic style trim was added as well. The apartments above the ice cream parlor also underwent heavy renovations though those appeared to be finished months ago. Below, the ice cream store before undergoing renovations.